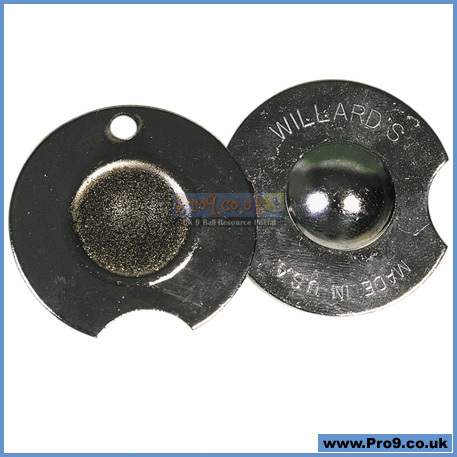 • This product is about as low-tech as you can get, and is as "old as the hills" - but it does what it says on the tin - texturise and shape the tip to a perfect "nickel" or "dime" radius. 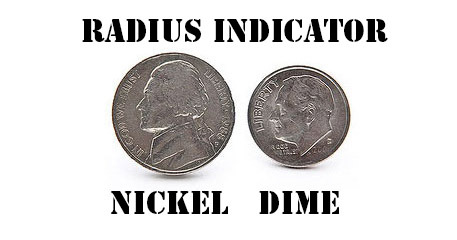 • Available in two shapes - one for player's that like their tip with a radius about the size of a "nickel" (large 5cent coin), the other "dime" (slightly smaller 10cent coin) sized. • Place Willard Tip Shaper on the floor and rest your foot on it, then place the tip of the cue into the textured bowl and gently spin the shaft and grind away the leather until the perfect shape is achieved. • There's a handy little curve on the edge of the tool to compare the shape of the tip to the ideal shape recommended. Price is for one tool - two tools pictured.